Donald Trump insisted he would score his relationship with fellow world leaders 10 out of 10 – but failed to name Theresa May in his list of counterparts. He may have a decent rapport with Putin and Xi Jinping (whom I sure see him as a useful idiot), thugs such as Erdogan an Kim Jong Un, and leaders who know they can buy him off. 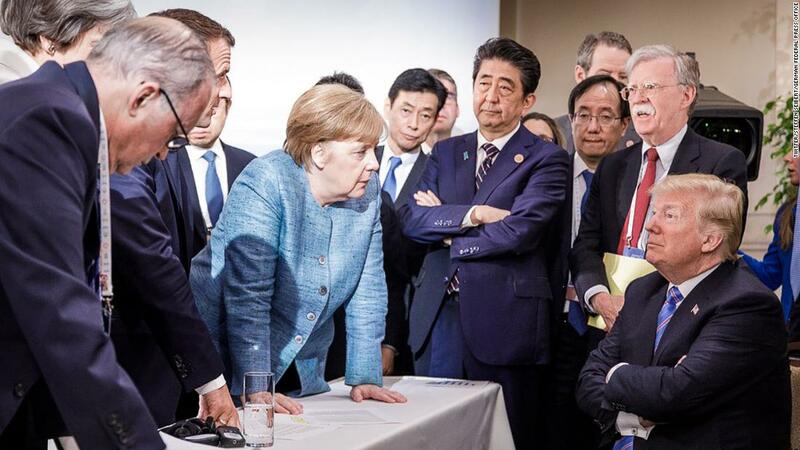 Merkel-Come on everyone if we concentrate hard enough maybe we can make his head explode! Shinzo Abe-(Thought) I'm the Prime Minister of Japan I wish he would stop calling me Mr. Miyagi. Trump-(Thought) What was the name of the actress who played Stefanie Tanner on Full House? I bet she is pretty hot now. Guy looking at camera-(Thoguht) Bye Felicia! Bye!